Nicholas Witchell is the BBC’s Royal Correspondent and one of BBC News most experienced newscasters who also excels in the corporate sector as a conference facilitator, awards host and after dinner speaker. 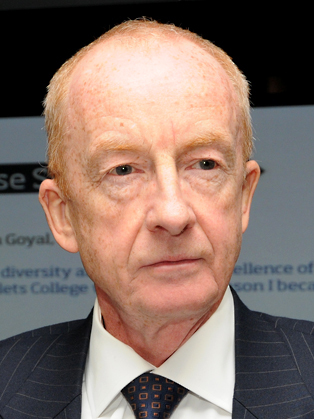 Nicholas Witchell joined the BBC as a graduate news trainee in 1976 after completing a law degree at Leeds University, where he edited the student newspaper “Leeds Student”. For nearly 4 years Witchell was a BBC reporter in Northern Ireland. He covered the assassination of Earl Mountbatten and the IRA hunger strikes. Nicholas became a network news reporter for BBC TV News in London. He was heavily involved in the coverage of the Falklands campaign. Witchell also made many trips to Beirut and Lebanon to report on the wars there in the early and mid-eighties. He was the BBC television correspondent with Margaret Thatcher throughout the 1983 general election campaign. He then returned to Belfast as the BBC’s Ireland Correspondent. Nicholas Witchell and Sue Lawley, were the original presenters of BBC television’s Six O'Clock News. The programme itself made the news one night in 1988 when it was “invaded” by a group of lesbian protestors. The programme went ahead with Witchell sitting on one of them! For 5 years from 1989 Nicholas was the main presenter, with Jill Dando, of the re-launched BBC Breakfast News. It was a time of huge international change and he often presented the programme live from the scene of major news stories in, for example, Moscow, Berlin, South Africa and Hong Kong. In the 90's he returned to front-line reporting for the BBC, first for Panorama and then as a BBC Diplomatic Correspondent, a role which took him frequently to Bosnia, and around the world, travelling with successive British Foreign Secretaries. More recently, Witchell's been one of the BBC correspondents reporting from the turmoil of Baghdad. In the early hours of 31st August 1997 Nicholas Witchell was the first journalist to broadcast the confirmed news of the death of Diana, Princess of Wales. Six days later he did the live BBC radio commentary outside Westminster Abbey at the Princess’s funeral. In 1998 he became the Royal Correspondent for BBC News. He has also been the BBC Radio commentator at national or state occasions such as the Ceremony of Remembrance at the Cenotaph (receiving a Radio Academy award for 2001); the Memorial Services to the victims of the September 11th attacks at St Paul’s Cathedral and Westminster Abbey; and the Service of Thanksgiving for the Golden Jubilee of the Queen. In the corporate sector, Nicholas Witchell is an experienced conference facilitator. He has worked for leading British and multi-national companies. He has also presented numerous award ceremonies and corporate videos. As a facilitator, Nicholas will grasp the key elements of the day, and link an event together with humour and incisive comments that have maximum impact on any Atlantic Speaker Bureau audience. Nicholas Witchell is a Governor of Queen Elizabeth’s Foundation; an Officer of The Order of St. John and a Fellow of the Royal Geographical Society. He lives in central London and has two daughters, Arabella and Giselle.